In the acknowledgements at the back of my Alpine Grove novels, I always include a thank you to beta readers. Not too long ago, someone asked me what a beta reader is. The definition of “beta reader” depends upon the author and the author’s process to some degree. Here’s how beta readers fit into my writing and production process. I write a first draft, set it aside for a week or so, then read it again, revise it, and give it to my husband. I refer to him as an alpha reader. After I get his comments, I revise the book again. Then I send it to my beta readers. In the past, I have had anywhere between two and four beta readers. After the betas read the book and give me their feedback, I revise the novel again and send it off to a copyeditor. Once I the manuscript comes back from copyediting, I revise it again. By the time I release the book, it has gone through four or five drafts, and five or six people (other than me) have read the story. Understanding the entire process helps explain where beta readers fall in the great scheme of things. Knowing what beta readers don’t do helps you get a better feeling for what they do. 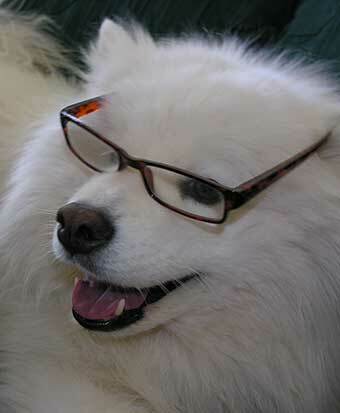 Samoyeds are not necessarily the greatest beta readers. The beta reader’s job is to read the book like a regular reader would and offer suggestions and feedback on the story. Much like beta software testers try out software before it’s released to the public and report bugs, beta readers try out a book and report problems. If you were providing beta feedback on paper, you might think of it as margin notes. For example, if you’ve ever been happily reading a book and suddenly found a problem that made you want to scrawl something like “Yo Ms. Author, that didn’t make any sense!” in the margin, you’d probably be a good beta reader. To be a good beta reader, you don’t have to have an MFA in comparative literature or even be a writer. However, it does help if you read a lot. What I hope to receive from beta readers is feedback on the “big picture” of the story. What works and doesn’t work? Is the book interesting? Some beta readers have worried about “hurting my feelings” but to me, what beta readers are doing is helping me create better books. To be an author, or at least one who is published, you must have an extremely thick skin. I’m grateful to all my beta readers and always list them in the acknowledgements. I also try to send copies of the final books in print to the betas who want them. Not surprisingly, a few of my beta readers have some book-storage issues, so sometimes I give them the final version in eformats instead.